You may hate seeing the Patriots win their billionth Super Bowl, but at least we get to see Rob Gronkowski do what he does best: celebrate. The former All-Pro tight end won't be alone. 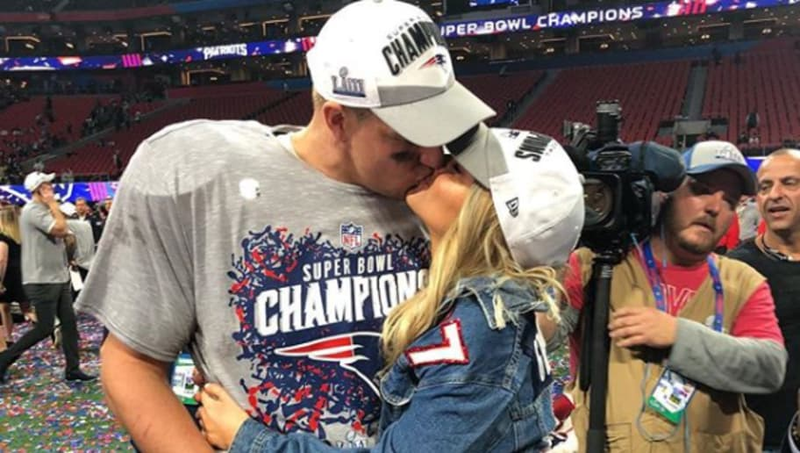 His model girlfriend Camille Kostek is just as pumped about the title as any New England fan is now that she and the Pats can finally silence the haters. Her and Gronk may be celebrating behind closed doors after her eye-opening Instagram caption. Camille said Gronk "tastes like a champion" after the Patriots low-scoring victory over the Rams in a sweet Instagram photo. This isn't the first time Gronk has "tasted" like this since he has numerous rings. Gronk did his best to contribute to the championship effort despite a low-scoring affair. The tight end finished with six catches for 87 yards, including an incredible diving snag that set the Patriots up for the only touchdown on the evening. Camille might have plenty of time to hang out with Gronk and enjoy their recent Super Bowl title with the tight end mulling retirement. She better enjoy that championship kiss from Gronkowski while she can. It could be the last one if he does decide to walk away from the NFL.